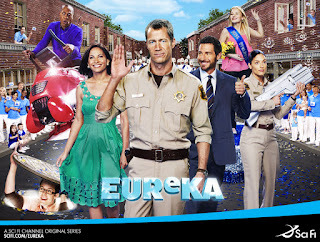 Eureka follows the happenings of the fictional town of Eureka, Oregon. The science fiction series ran from 2006 to 2012. When anyone on the show drinks something. When Jack's jeep is destroyed. When someone says the word, "Theoretically." When Joe hits someone or draws a gun. When anyone shouts "Faro" in an irritated or angry voice. When a device of some type malfunctions or fails. When Section 5 is mentioned. When something bad happens to or in Cafe Diem.